No matter what line of business you’re in or how much of a budget you have, the satisfaction of your customers is crucial to the success of your company. With unprecedented levels of competition and instant avenues for the provision of unbiased feedback, it has never been more vital for businesses to keep their customer base happy, as a company’s reputation can make a huge difference in the retention, acquisition or losing of customers. We came across an infographic from Paradyn which explains why VoIP phone systems enhance customer experience and make it far easier for them to receive a high standard of service from companies whenever queries are made. Quite often, it is the level of service received from a company’s support team that can definitively shape a customer’s perception of the business for better or for worse, so the provision of a smooth, pleasant customer experience is of paramount importance. In this always-on modern world, customers don’t want to be restricted to pre-defined time slots for getting their queries resolved. They want, and may even expect, an immediate resolution no matter the time of day. As VoIP is a global service where customer support representatives are always available, customers can have their voice heard straight away instead of needing to wait until the next working day for a response. VoIP eliminates one of the most frustrating aspects of call center query resolution, that of having your query passed between numerous representatives to whom you need to relay the nature of the query each time. One query is handled by one person who will be familiar with the details and with whom you may develop a rapport so that. It’s good to know that a familiar voice is handing your query. 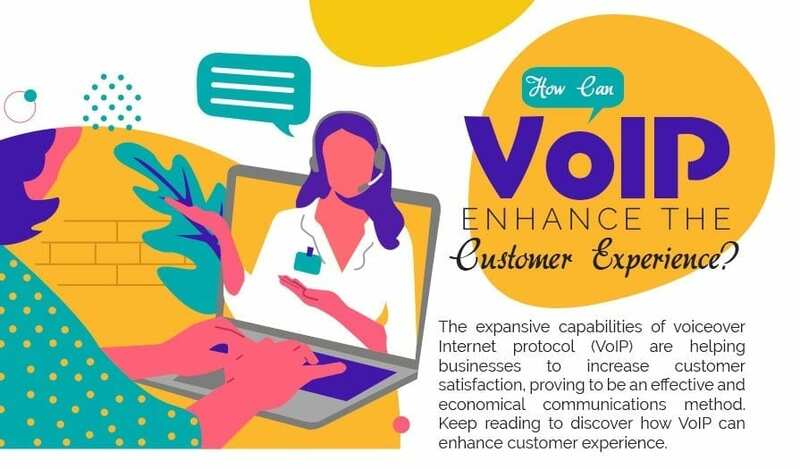 Check out the infographic below for further information on VoIP’s positive impact on customer experience.